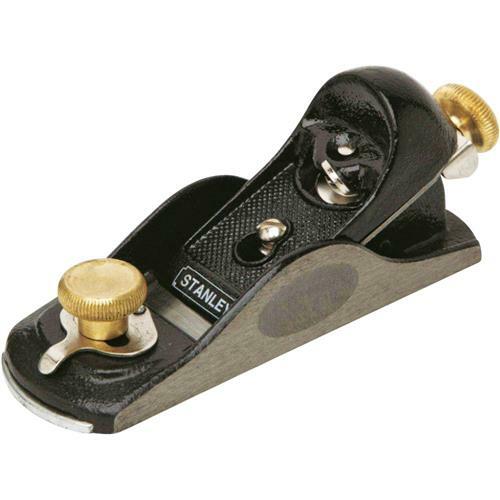 This Stanley 6 1/4-inch Contractor Grade Block Plane is ideal for planing end grain and plastic materials. The block plane has a fully adjustable cutter that rests at 21-degrees and adjusts to 13 1/2-degrees, for less vibration, more control, and a finer finish. Its hardened, tempered steel construction gives you a precision-ground cutter edge that's durable and reliable, and a cutter mechanism that moves with your needs for complete manageability. This block plane boasts a quick-release cam lock that makes iron removal easy, and there are finger grips machined into the sides, making single-handed use unbelievably easy. This block plane is 6 1/4-inches long with a 1 5/8-inch cutter.